I love the squares of Europe, and Salamanca is one of my very favorites beautiful in Plaza Mayor. It is fun just to spend hous sitting out here and watching the wide range of diversity in the people, as this is an international town because of the famous university - one of the oldest and largest in Europe. The "old city" in impressive and an UNESCO heritage site. 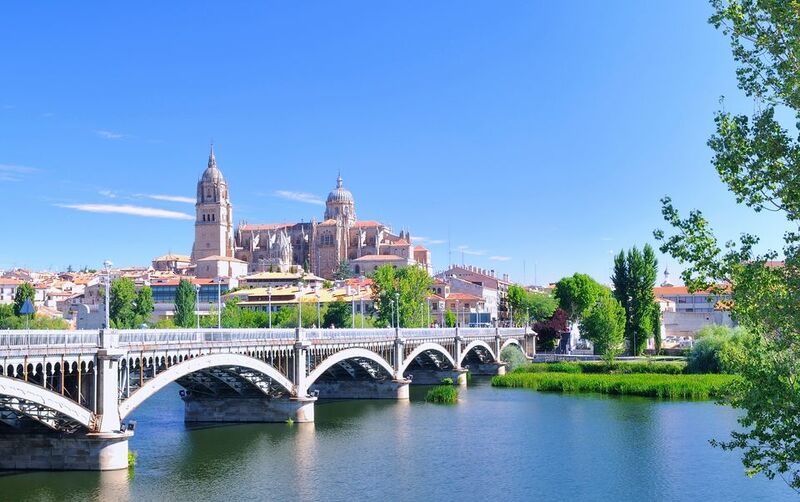 A favorite of both travelers and students alike, Salamanca is a beautiful city with an old University. Great city to visit during 2 or 3 days with family or friends. There are a couple of very interesting buildings here: casa de las conchas, University of Salamanca (the oldest in Spain), Old and New Cathedral of Salamanca, Plaza Mayor and more. The old city is UNESCO World Heritage Site. We absolutely loved Salamanca, the Plaza Mayor was incredible, especially at night. Salamanca is a city that is really underrated! It is compact and clean. It is easy to see the major sights as they are all together. It has great hotels that are centrally located and it is inexpensive. I loved the whole gothic feel! !